It goes without saying that an integral part of any vacation to a foreign country is tasting its local cuisine and drinks. Luckily, there are many Italian beverages to choose from and we’ve put together a short overview of them. What is Italy's national drink? It’s difficult to single out only one beverage when there are actually many traditional Italian drinks. The most famous Italian liquor is indeed Limoncello or Limoncino which is made of lemons. As a rule, locals prefer to have a light alcoholic aperitif drink before a meal, and the most common Italian aperitivo is Campari. 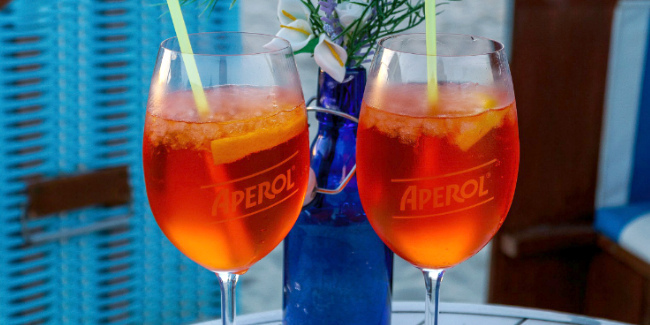 Aperol, Aperol Spritz, Martini, and Cinzano are among other widespread Italian alcohol which you can taste. Wondering how much wine does Italy drink? The answer is a lot! But even more so, Italy produces approximately 45 to 50 million hectoliters of wine every year, making it one of the largest wine producers in Europe and the entire world. There are 20 wine regions in Italy, each specializing in their own type of high-quality wine. The most famous region of them is, of course, Tuscany. Perhaps, the most popular white wine of Italy is Prosecco and the best-recognized red wine is Sangiovese. You can learn more about different wines of Italy by region in this Italy Wine Guide. Big fan of espresso, latte macchiato or cappuccino? Did you know that these are all Italian words? The culture of coffee-drinking in Italy plays a special role in the everyday life of the locals and, surprisingly, coffee is a very popular drink of Italy. One of the most famous Italian coffee brands is Lavazza coffee, so make sure to taste a cup during your trip to Italy. Can you drink Italy tap water? Although the tap water in Italy is of good quality, it is not advisable to drink it. It is safe to drink water from the tap but it might not taste good and thus it's better to consume bottled water. Interestingly though, in Rome there are over 2500 drinking fountains dotting the city with absolutely safe to drink water that comes from ancient aqueducts. These fountains are called "nasoni", most of them are hundreds of years old and are part of the water network developed way back in the Roman Empire and still function perfectly today.